In a record year of optimism for some of the Midwest’s most notorious and perennially vacant buildings, the City of Chicago, along with Jam Productions and Fairpoint Development, has announced that the lights will turn back on at Chicago’s Uptown Theatre after almost four decades of vacancy. The $75 million restoration project will be the catalyst in one of Mayor Rahm Emanuel’s early campaign promises to create a sustainable and lucrative entertainment district in Uptown slated to rival others downtown. Restoration of the Uptown Theatre is enhanced by a surge in infrastructure improvements to the neighborhood, including a $203 million restoration of the nearby Wilson Avenue CTA Red Line station and forthcoming renovations to both the Lawrence and Argyle CTA Red Line Stations. An additional $6 million has been allotted for street improvements already underway. According to a press release, city assistance for the Uptown restoration includes $14 million in Property Accessed Clean Energy (PACE) financing, $13 million in Tax Increment Financing (TIF) funds, and $3 million from the cities Adopt-A-Landmark fund. The remainder of the $75 million is expected to come from private financing sources. Shortly after his election in 2011, Mayor Emanuel began speaking of creating a music and entertainment district anchored by the Uptown, the Riviera Theatre, the Aragon Ballroom, and the Green Mill, forming a nonprofit to back public-private infrastructure projects, the Chicago Infrastructure Trust (CIT). The organization arranged for a purchasing agreement with Jam Productions in an attempt to turn the Uptown into a non-profit, but the effort ultimately failed. Jam Productions acquired the structure in 2008 through a judicial sale. Built in 1925, the Uptown Theatre was designed by architects Cornelius W. and George L. Rapp for the Balaban and Katz theater chain. Rapp and Rapp were incredibly prolific in Chicago, designing all of the city’s well-known vaudeville theaters from the time period, including the Rivera Theatre, the Chicago Theatre, the Bank of America Theatre (originally the Majestic), the Oriental Theatre and the Cadillac Palace (originally the New Palace Theatre). The Uptown Theatre was listed on the National Register of Historic Places in 1986, is a Chicago Landmark, and contributes to a landmark district. In an unlikely story of preservation by neglect, the Uptown has been dark since the J. Geils Band played a concert there in December 1981. 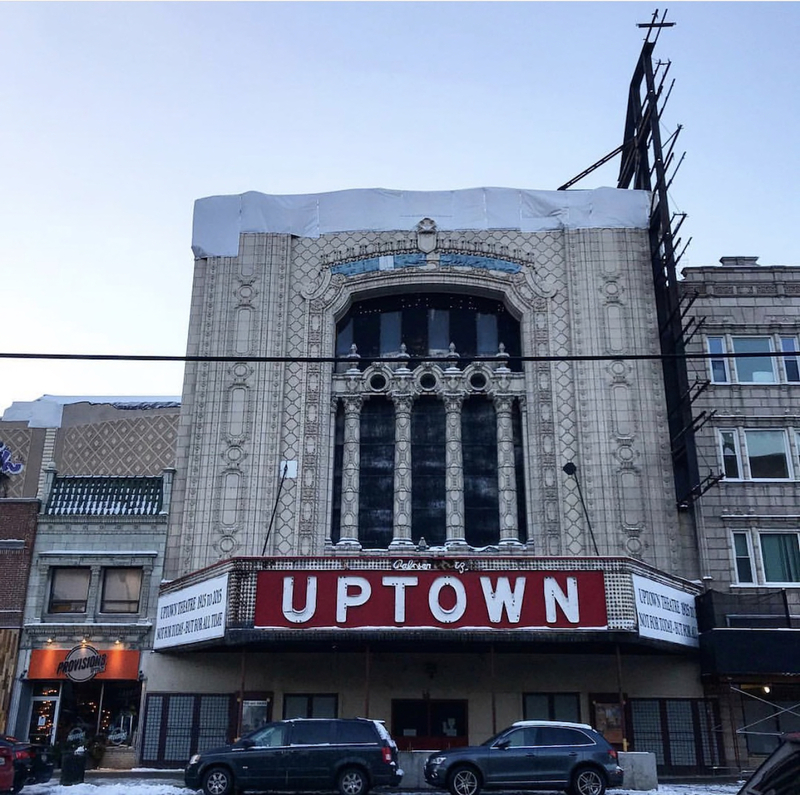 While no immediate plans for demolition have ever faced the Uptown Theatre, a lifetime of deferred maintenance and its seemingly constant flux in ownership have kept the building on the radar of Chicago preservationists, as well as organizations like Preservation Chicago, Landmarks Illinois, and the National Trust for Historic Preservation. Friends of the Uptown, a non-profit organization not affiliated with the restoration, was formed by community volunteers in 1998. The Uptown Theatre found itself in the winter of 2014 with its heat turned off, causing a 30-foot icicle to form in the basement. The building’s decades of vacancy along with its size—4,600 square feet across three levels—begs multiple questions. With the effects of 37 years without general upkeep to address, $75 million may not be enough to bring the Uptown back to modern standards. Restoration has been given a 2020 completion date, a tall order for a structure with complex architectural elements in various states of disrepair.